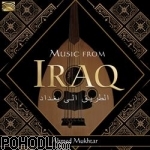 A colourful and glorious album of traditional Iraqi maqams (modes) with soothing instrumentals and exciting melodies. Award winning master composer and virtuoso oud player Ahmed Mukhtar presents beautiful music from one of The Middle East’s most cultural lands, known for its poets, painters, sculptors and musicians… Enjoy the beautiful sounds of Iraq. Strona wygenerowana 23.4.2019 v 03:03:17 za 0.146 sekund.